***Everything should be functioning normally now. Sorry for the technical issues. After what was turning out to be the first slow week in months Friday changed all that with markets and metals moving higher. On this week’s show we focus a lot on the overall quite market for metals stocks. We even dive into a couple specific stocks that our guests are following. Please keep in touch be emailing me at Fleck@kereport.com. Also if anyone has any suggestions on how to get the full hour segment on our Podcast please let me know. We have been working on it for the last couple weeks. Segment 1 – Byron King kicks off the show with comments on why only true exploration drilling is getting noticed. He also shares a couple companies that he is following in his newsletter. Segment 2 – Chris Kimble, Founder of Kimble Charting Solutions focuses on three currency charts (posted below) that could have an impact on the PMs. Segment 3 – We step away from the metals sector with Mike Larson as he breaks down what typically happens after a Fed pause. Segment 4 – John Kaiser wraps up the first hour by diving into a couple stocks that he thinks have a chance to make some positive moves this year. The did the show in sign language (for the hearing impaired). Hi everyone, we have our webmaster looking into why the audio player is not working. Hopefully we can fix it soon. I found the mp3. See links I posted down below. Or KER whiskers…cut my self shaving listening to this here KER audio! I just realized you had the name change to the KER Whisperer. Yes, he keeps CLAWing his way up the list of dignitaries… ha! That was a crazy story on that translator just making up gestures next to all the world leaders, because he sees ghosts and angels and has multiple personalities. Spooky. I’m getting “Invalid Source” on all programs. Anyone have Cory’s phone #??? neither weekend show working. You guys on shutdown with the government? Bon appetit! (after yesterday’s move there might even be someone here who can afford it … everyone else … here’s to the celebration lunch for Frank Holmes and his forecast! Somebody here should be willing to sponsor it, I’m sure … put me down for a glamburger). 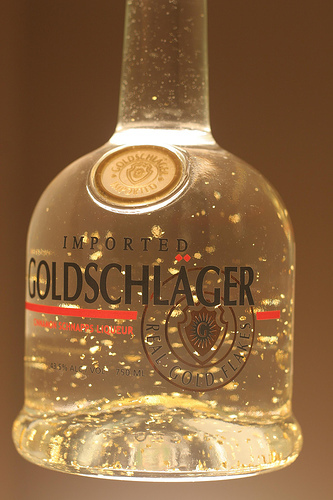 Yes there are actually a number of high-end food items that have offered edible gold as topper. I actually used to take a daily salt infused with 24K gold flakes to help cleanse toxins from blood and currently take monatomic gold ormus supplements daily. why can’t I download this and listen at work? Never got around to adding my comment on the yamana discussion the other day……Malartic is going into production this quarter so that will only boost the stock price even more with gold going higher as well…safe jurisdictions starting to be a big factor again for those who want to be able to sleep at night..
Wolfster, thanks for the info. Yeah I just use GZZ and few other royalty companies as profit dumpsters for deep storage from winning trades. Regarding royalty companies I like the future regular income that can be generated without having to take all the exploration risk or without putting up most of the money for exploration/development/mining the projects. They are just the brokers of the land and opportunity for a regularly scheduled payment with upside participation on producing projects. It’s a great business model and return rate for capital invested with a lower burn rate internally, and eventually a stream of payments. Slow and steady wins the race as Franco Nevada and Royal Gold have shown over the years. GZZ is trading at a huge discount to RZZ, even though it owns half of RZZ and is the parent company that spun it out, and GZZ has all the other other value drivers like the JVs with Bonterra, Sirios, Alexandria Minerals, and Battery Minerals. Also they own a chunk of Val-d’ Or and International Prospect Ventures. GZZ has the high ground and should always be trading at a premium to RZZ, but the markets don’t seem to understand this fact…… yet. Once more focus goes on RZZ for their main royalty with Yamana & Agnico Eagle, then maybe a few more analysts will wake up to this opportunity. Sirios and Bonterra have had good newsflow over the last year, so that’s only adding to the value. Preaching to choir Ex. 😉……l believe some discount is understandable if there is tax implications for selling their stock in rzz??? Yeah, I know you know…… and that was just a general GZZ repost from the conversation we were having the other day. Wolfster, I don’t believe their tax implication is why there is the discount, but rather most investors following the Malarctic royalty that RZZ has with Yamana/Aganico Eagle, don’t realize GZZ owns 44.7% of the entire company Abitibi Royalties, which would put them at 89.4% of the valuation of RZZ; but then Golden Valley still has all their other assets and JV partnerships which combined should give them a clear premium over RZZ (even with any tax considerations). This slide breaks down the valuations better on GZZ’s asset base and where their valuation should be (although don’t know what value to assign to some of the JVs that are moving along as they are works in progress). Another thing to consider is that abitibi will probably start paying a dividend as malartic ramps up to full production which is appealing to people. No guarantee gzz will pass on a dividend to shareholders. Just another thought as I wait for back X-rays. Good point on the dividend as that attracts a different type of investor for accumulation. However, even with that in RZZ’s favor, GZZ is still undervalued. Also I RZZ keeps diluting down their shares which reduces down GZZ’s ownership stake, so that a real factor, but would affect current RZZ shareholders as well. Correction to that last post, I meant GZZ has been diluting down their shares some reducing their stake in RZZ and that is affecting current GZZ shareholders. For clarity, RZZ has been repurchasing shares the last 2 years. Another good point. Thanks Wolfster. They only have 12.5 million shares out currently (which is not many and a pretty tight share structure) and they’re up to $10.68 per share as a result. Looking forward to movement in the Malartic. I really enjoyed Byron’s editorial this weekend and agree with him on Sabina Gold being an example of a project that not only has the goods, but also further de-risked their project by building the access water port to bring in supplies. (SBB) (SGSVF) Sabina is one of the development projects like (PG) Pure Gold or (TML) Treasure Metals that looks ripe for a takeover offer. Byron also discussed the top Canadian Gold mine – Malartic that Yamana & Agnico Eagle operate, which we discussed up above (since Abitibi Royalties / Golden Valley) get an NSR. Does Byron still have any affiliation with Bill Bonner? Don’t know. He’s mostly involved with Jim Rickards newsletter now. Audio is working now. Thank Cory, Big Al, and the KER crew for all that you do. It can now rise for many weeks and, in my opinion, has a very good shot at $1,400 and higher — 5 year highs. Thanks Matthew. I forgot to delete that (+) from the link. Of course FYI only; not a recommendation to buy or sell anything! How many of you think that SPY will soon resume its plunge versus GLD? Looks like a slam dunk. 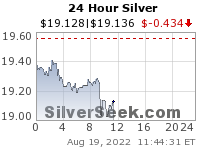 The general markets and gold are going to get clocked. 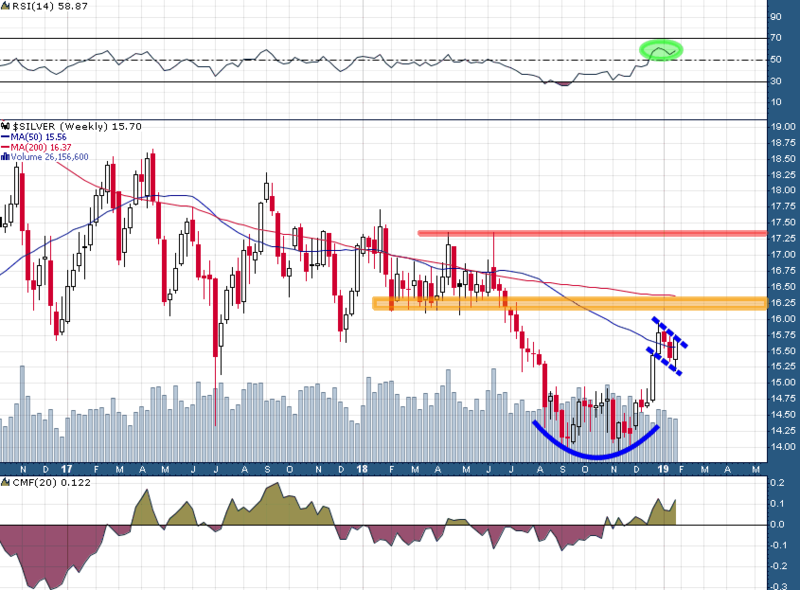 The copper chart (weekly) looks awesome…!! Copper might get something going but, for now, it doesn’t look nearly as good as gold. 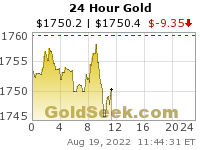 There is also no technical reason to expect gold to get clocked. Notice the potential big H&S top pattern. Great show. Thanks Big Al and Cory for all that you do for the blog. Gwen Preston, Resource Maven – “Two potential paths (both golden)”. Jordan Roy-Byrne, Editor & Publisher of The Daily Gold Premium “One More Leg Down & Greatest Setup Ever for Gold Stocks”. I always thought Jay was a decent person with a good heart but I do not know him personally. With gold’s weekly MACD at 11, it might be interesting to know that the 30% gain of 2016 resulted in a weekly MACD at 45 — the same as the big move of 2006. But the possibilities are better. In 2008, it topped out at over 60 and in 2011, it reached about 110. I don’t know what it will be this time, but the conditions are ripe for a very impressive advance. The miners need to show strong follow-through versus gold. The dangers of addbacks in mergers, involving debt. Hi Matthew – It would be nice if Friday’s action was not just a flash in the pan. Newt week should be interesting to see if there is follow through. Still just waiting and watching, but I have been selling stregth and buying weakness in the mines. Not reall modifying my over all exposure but not reducing either. I think we are close with IPT, but I feel better when it breaks out over 0.26/27 (ISVLF). Hi Charles, I agree and would be surprised if it was a one day wonder. We’ve all been through some big head fakes but Friday’s action “felt” right and did some good things technically that puts the odds on the bullish side, in my opinion. My guess is that the move will continue into Wednesday morning before suffering a setback at the time of the Fed’s announcement. Thanks. That chart give good perspective. Can post the weekly? The bullish engulfing is offset by lower lows and lower highs and uninspired volume in my mind. It will be interesting to see what next week does along with the Fed. I like this cycles guy over at the gold-eagle website. He seems very balanced in his approach and has been able to time trend changes very well. He is predicting a February intermediate decline. While that seems like an over-simplification of blockchain, there is no doubt it was over-hyped at the end of 2017 and early 2018, a year ago now. It appears cryptos are still being pressured further, but am getting curious to see where the intermediate bottom is going to be for a potential bounce in the sector.